The White House Press Office has decided to keep the Boston Herald from reporting on today’s Boston fund raiser for Barack Obama‘s re-election campaign efforts. Evidently, the White House felt that the paper has demonstrated a bias in its history of reporting on the President. 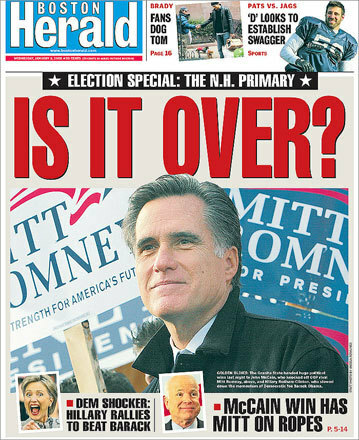 In response to the Herald‘s press request, White House spokesman Matt Lehrich pointed specifically to the paper’s decision to run an op-ed piece by form Massachusetts governor and potential 2012 Republican candidate Mitt Romney as a front-page story. I tend to consider the degree to which papers have demonstrated to covering the White House regularly and fairly in determining local pool reporters. My point about the op-ed was not that you ran it but that it was the full front page, which excluded any coverage of the visit of a sitting US President to Boston. I think that raises a fair question about whether the paper is unbiased in its coverage of the President’s visits. He did add, however, that “we will continue to consider the Herald for local pool duty for future visits” and that local pool duty by the Boston Globe was arranged well before the Romney piece ever ran. This is a misstep, pure and simple. Whether he has a valid point about the Herald‘s front page is immaterial. The White House is free to push back against that in a number of ways. Inferring an editorial litmus test for access to the President is counter to the notion of a free press. On the other hand, Lehrich is correct that the “regularity” with which a news organization covers the President is relevant, and he should have stuck to that standard.